The Classical Review publishes informative reviews from leading scholars on new work covering the literatures and civilizations of ancient Greece and Rome. 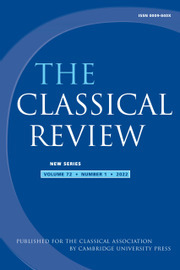 Publishing over 150 high quality reviews and 50 brief notes every year, The Classical Review is an indispensable reference tool, essential for keeping abreast with current classical scholarship. VIOLENCE IN ROMAN LITERATURE - (M.R.) Gale, (J.H.D.) Scourfield (edd.) Texts and Violence in the Roman World. Pp. xvi + 384. Cambridge: Cambridge University Press, 2018. Cased, £90, US$120. ISBN: 978-1-107-02714-5. THE CHRONOLOGY OF EARLY EPIC - (O.) Andersen, (D.T.T.) Haug (edd.) Relative Chronology in Early Greek Epic Poetry. Pp. xiv + 277, figs. Cambridge: Cambridge University Press, 2012. Cased, £60, US$99. ISBN: 978-0-521-19497-6.